Whiskey Shooter (centre) can prolong her campaign if she runs well in the Mode Stakes at Doomben. Trainers Gai Waterhouse and Adrian Bott will use a stakes race at Doomben to test the Magic Millions credentials of Whiskey Shooter. The stable has always had a good opinion of the filly, who won on debut at Canterbury before earning a spot in the Magic Millions Classic last January, finishing seventh behind Sunlight. 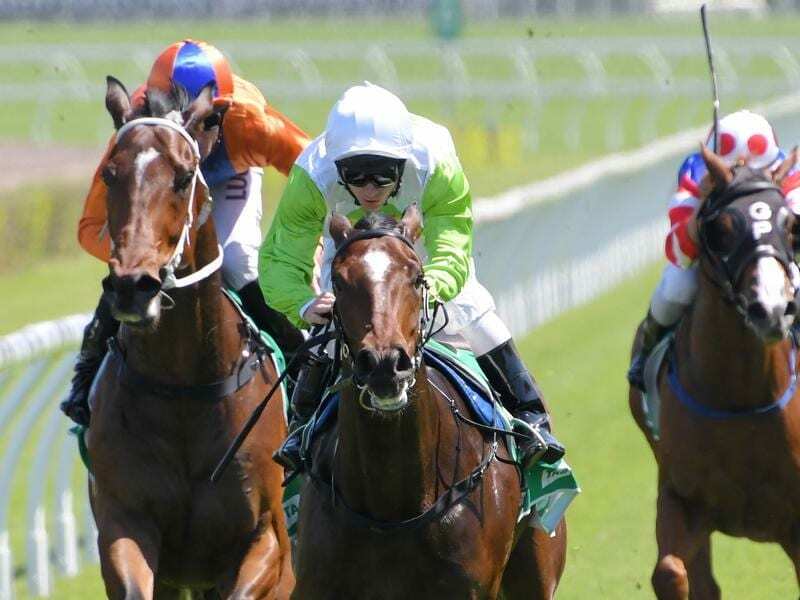 The lucrative carnival is again in the stable’s sights but Bott says Whiskey Shooter must prove her worthiness against a handy field of fillies at Doomben, led by Silver Shadow Stakes runner-up Outback Barbie. “She contested the Magic Millions two-year-old race at the second start of her career so that shows you the opinion we had of her early on,” Bott said. Whiskey Shooter resumed with a solid on-pace win on the Kensington track in October but the effort of carting 60kg to a first-up victory told at her next run when she tired to beat one rival. Bott says in hindsight her fresh effort may have left her flat. The stable has given her time to bounce back, topping off her preparations with a barrier trial at Hawkesbury on Monday. “She’s coming off the back of a disappointing performance at Canterbury, we felt she might have just been flattened by her first-up win on the Kensington track where she threw everything at it and was ultra-impressive but she just failed to follow up that performance,” Bott said. Damian Browne has the ride on Whiskey Shooter who has drawn barrier seven. Outback Barbie heads betting on the Mode Stakes and will be bidding to land an overdue win after a luckless campaign in Sydney after her Silver Shadow placing.